Mr. Downing, elected chairman in 2017, will this year celebrate nine years with the trust, having served previously as vice chair and chairman of its strategic and financial planning committee. During his tenure, the trust used PTP dollars to extend the Metrorail Orange Line to Miami International Airport and funded the purchase of 136 Metrorail cars and 300 compressed natural gas Metrobus vehicles. 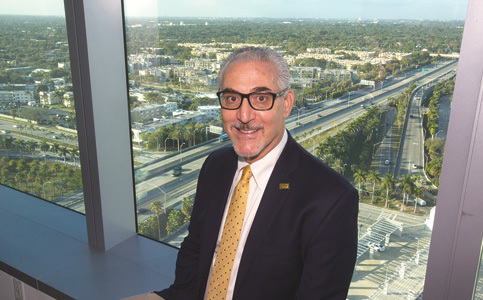 Other related projects in various stages, he said – including studies and development of six corridors prioritized for rapid transit expansion through the Strategic Miami Area Rapid Transit (SMART) Plan – will further improve the county’s traffic congestion and transit problems. Mr. Downing, founder and principal of investment advisory firm CameronDowning and board member of the Financial Planning Association of Miami, sat down with Miami Today reporter Jesse Scheckner. The interview, recorded by Jahmoukie Dayle, can be found Friday at http://bit.ly/2uNHy0Q. To read the full article and the rest of the Miami Today issue, subscribe to e-MiamiToday, an exact replica of the printed edition. Numerous empty parcels remain along the South Dade busway, while neighborhoods extend for hundreds of long blocks around it, replete with car-stuffed driveways. I hope our development will make future transit planning geometry simpler. Bravo Mr. Downing and CITT. With escooters and Underline maturing, shouldn’t we permit tall buildings along metrorail even in gaps between stations? Indeed, driving a car to a mass transit location defeats the whole purpose of mass transit.